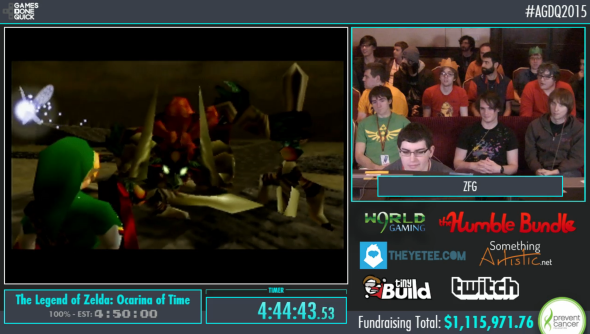 Awesome Games Done Quick, a week long speed running marathon raising money for the Prevent Cancer charity, has finally come to a close this morning. This year’s run has been nothing less than phenomenal: raising a whopping $1,180,000 at the time of writing, and still increasing. However, a bug in the donation tracker has resulted in some donations missing the tally, which according to AGDQ event director Andrew Schroeder, puts the estimated total at over $1.5 million dollars. At the finale of the marathon, Andrew Schroeder revealed the fundraising total, but had some unexpected news. “Several people have contacted us since Thursday, letting us know that their donations haven’t been showing up.” Schroeder explained. “We don’t know yet the exact cause of the bug in the tracker, but we can confirm that there was indeed one that caused donations not to show up. There were over 18,500 separate donors during the marathon, and over 26,000 unique donations; several donors donated multiple times, and the average donation was over $45. The special AGDQ Humble Bundle added a respectable $192,547 to the pot too. If you want to catch up on any of the speed runs during the event, check out the AGDQ Twitch channel for their past broadcasts, and use their schedule to help locate any particular game. What was your favourite part of AGDQ this year?